Bus from Alor Setar to Genting Highlands is one of the important routes to allow local people who stay in Kedah to travel to one of the reputable tourist attraction in Malaysia, Genting Highlands. With no direct flight and train service available for this route, bus from Alor Setar to Genting Highlands is their only transport option from Alor Setar to Genting Highlands. Antar Holiday Express is the one and only bus operator serving bus service from Alor Setar to Genting Highlands. They only provide 1 daily departure at 10am to Genting Highlands from Alor Setar. In the event of high demand season, Antar Holiday would have extra coach at 10am same timing. The duration required for bus from Alor Setar to Genting Highlands will takes at least 6 hours depending on traffic and weather conditions. The bus fare is reasonably charged at RM 55.00. The departure point in Alor Setar is at Antar Holiday Express headquarter office, which located at Lot 2888, Jalan Kuala Kedah, 05400 Alor Setar, Kedah Darul Aman. 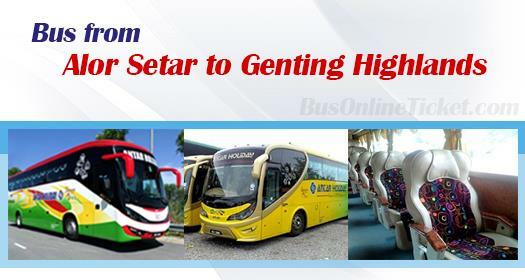 The bus from Alor Setar to Genting Highlands will arrive at Awana Bus Terminal. For those who want to go to Genting Highlands Resort, they need to take cable car service from there. Currently, the outdoor theme park in Genting Highlands is closed for major renovation for the opening of their new theme park, Twentieth Century Fox Theme Park, in late 2017 or in early 2018. There will be up to 25 rides and attractions offered for children and adults. The rides and attractions are built and designed based on film and franchises such as Night at the Museum, Ice Age, and Titanic. With the upcoming completion of Twentieth Century Fox Theme Park, Antar Holiday Expressâ€™ bus route from Alor Setar to Genting Highlands will play a significant role to bring travellers in the north to visit Genting Highlands. Booking online in advance at BusOnlineTicket.com is always recommended to avoid disappointment due to limited bus schedule daily offered by Antar Holiday Express.